in the historic West Park Presbyterian Church on the Upper West Side of Manhattan. 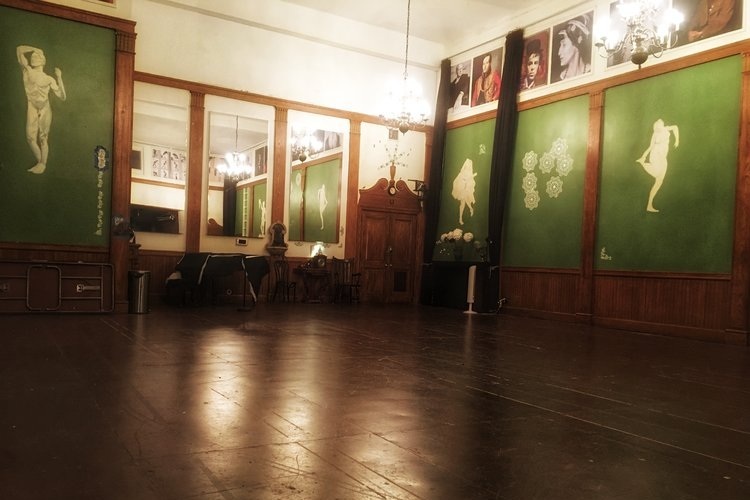 The Center at West Park is a secular, not-for-profit organization that offers a diverse range of programs for artists, audiences, and the neighborhood; manages the building’s venues; and stewards the restoration of its historic exterior. New Amsterdam Opera presents Jules Massenet's rarely performed masterpiece Hérodiade in concert. An evening of original puppetry and object theater created by the 2018-2019 Object Movement resident artists. Each program features four new short pieces of diverse subjects and puppetry styles. The Center’s artist residencies create opportunities for performing artists of diverse backgrounds to develop and perform boundary-pushing new work. Our seasonal performances and festivals connect adventurous audiences with some of New York City’s most exciting and engaging artists. We nurture the next generation of leaders in arts administration through our fellowship program. Our Theater Artist Residency Program nurtures exemplary and boundary-pushing theater artists and companies by providing free performance space, subsidized rehearsal space, and a 50/50 split of ticket sales. We support the creation of new works and the re-working of classic texts in contemporary contexts in order to diversify and enrich the theater community of New York and to attract and challenge enthusiastic and adventurous audiences. Object Movement is a curated festival and developmental residency for puppeteers and object theater artists, culminating in a May festival of new short and full-length works. The residency supports the vital and innovative puppetry community in New York and calls attention to how this ancient and global art form speaks to urgent contemporary social concerns and artistic questions. Curated by Maiko Kikuchi, Rowan Magee, and Justin Perkins. The Furnace Festival is a workshop forum for incendiary new plays, developed in residence at The Center at West Park. Participants are given one week in the Center’s 60 seat Balcony Theater, a small production stipend, and up to 20 additional hours of free rehearsal space to forge a new play in the fiery heat of New York in August, culminating in two workshop performances on Friday and Saturday nights. Applications for the 2019 Furnace Festival will be available online soon. The Center at West Park’s Arts Leaders Fellowship Program is an opportunity for early career arts professionals to build skills and experience while working closely with the Center’s staff, learning about non-profit administration, and shaping the direction of a new performing arts center. We need your support to build a thriving new home for the performing arts and preserve our historic landmark building. Your donation will make our work possible by funding our artist residency programs and the Landmark Restoration Fund. Please consider making a contribution today. We are deeply grateful for your support. The Center is partnering with the New York Landmarks Conservancy and award-winning preservation architect Page Ayres Cowley to develop a plan for restoring West Park’s 1889 edifice. The first stage of the plan includes repairing the Community House roof to prevent further damage, followed by a Feasibility Study and Pilot Project. 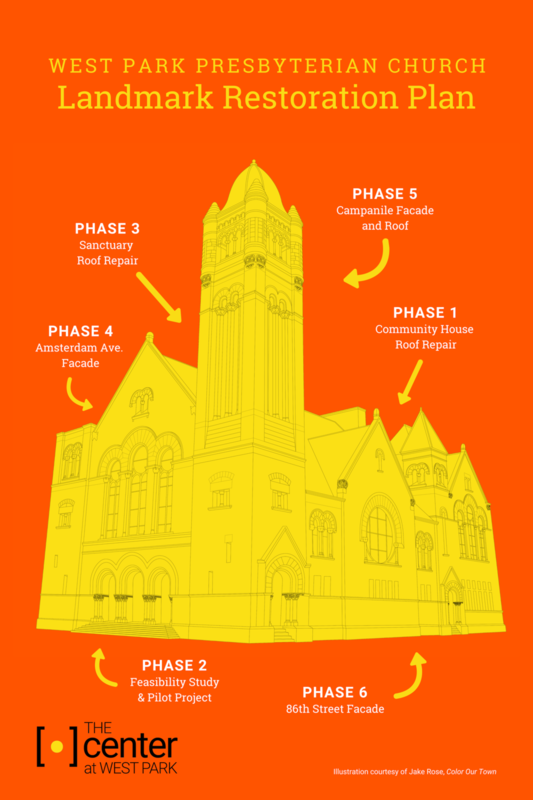 Full restoration will include restoring the masonry and windows, adding accessible entrances, and removing the sidewalk shed on Amsterdam Avenue and West 86th Street.